Last month I found myself staring at a new box of Honey-Nut Cheerios in the pantry. The cereal was purchased for guests who decided they liked yogurt better. Oh well…surely I can invent a creative treat…result was Cereal Snackeroos. This treat was a hit with family, neighbors and older folks at an assisted living center. Get creative…what’s in your pantry? Mix the ingredients above in a large bowl. Butter 9×13” pans. In a small saucepan, combine white Karo and sugar. Bring to boil. Take from heat and stir in peanut butter. Stir until smooth. 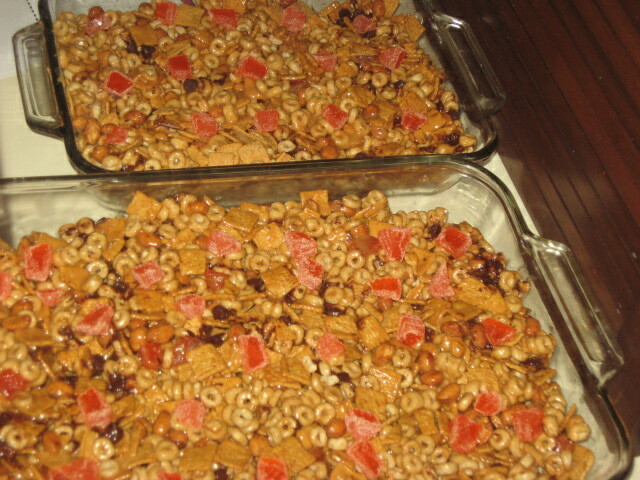 Pour over cereal mixture and toss to coat mixture completely. Pour into buttered pans and let cool. Cut into squares. You can decorate the top of each square with an orange slice, if desired.